ISO 9001:2015 Frequently Asked Questions. CG Business Consulting are experts and we work with our clients to ensure everybody understands the process. The process involved several open workshops with current users of ISO 9001, plus a web-based survey of users and potential users of the standard in 10 different languages. In addition, the latest concepts and trends in quality managements were studied. The revision is planned to be published in September 2015, with a three-year window given to modify previously certified quality management systems. ISO 9001: 2015 aims to respond to the latest trends, and to achieve compatibility with other management system standards. It also aims to reflect on the requirements of the multifaceted, challenging and dynamic environments in which organisations operate today. Yes, all the ISO 9000 documentation should be available as a package. This will be confirmed closer to the publication date. A comparison document will be produced once the new standard has been published. 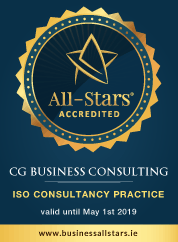 The cost of an ISO standard implementation and certification is an agreed fixed fee from the beginning of your business relationship with CG Business Consulting and it will not change throughout the ISO process. The cost is not as much as you might think and is based on the following variables: The standard/s you require. The number of company sites. The number of employees. The amount of support deemed necessary to ensure that your business is prepared and ready for certification. Contact CG Business Consulting today and enquire how much ISO certification will cost your business. Our advice is that due to the fact that there is proposed changes to all three standards. This will in turn make the system integration process easier as there will be a stronger connection between all three standards. The main issue is that all three standards have different projected publication dates. Due to this you will need to plan carefully how you make these transitions and retain the certification on each standard. At this point we recommend that you begin informing your team internally that the new revision to the ISO 9001 standard is almost here. It may also be worth examining your processes to see if they are in line with the new structure. Just a note, it is essential that all of your processes remain compliant with the ISO 9001:2008 standard document until your transition to ISO 9001:2015 is complete. The current ISO 9001 standard will be recognised through a 3 year transition period, it can also be audited up until then. We expect this to be until September 2018. It is important to note that all organisations must make their transition to the ISO 9001:2015 by the transition deadline when ISO 9001:2008 certificates will no longer be valid. Yes – providing your system meets all of the requirements of ISO 9001:2015. We recommend that you continue to implement the standard as there is still a 3 year transition from September 2015. We would also recommend that you make yourself very familiar with the new structure as building your system around this will benefit you in the future. Yes indeed, no matter what size your business is, being ISO 9001 certified is of huge benefit to you. Thw ISO 9001 Quality Management System has been designed to adapt to businesses of any size. Yes, absolutely the ISO 9001 is relevant to even the smallest companies. The beauty of it is that you are able to make the ISO system simple, to suit your small organisation. The term is no longer used but Top Management have to appoint a representative to deal with reporting on effectiveness etc. Annex SL (also called the “high level text”) is the mandatory common text for all management system standards. This is intended to promote integration and common approach. Yes. Most organisations will still find one useful. All accredited certifications will have to transfer to ISO 9001:2015 within 3 years of publication. Unlike ISO 9001:2008, there is no specific area where exclusions are allowed. The rule is “if it can be applied, it shall be. Please refer to Annex A.4 of the ISO/DIS 9001 standard for clarification of applicability. A typical Quality Management System contains three tiers of documents and a foundation of records. It is often explained by a triangle, with a Quality manual to the top point, management operating procedures on the second tier and work instructions on the third level. Most Quality System documentation has links between the tiers enabling the reader to navigate clearly through the system, finding the necessary documents required and the records associated with these. The larger the organisation the more complex the layers of system manuals and procedures. The top level can be a corporate quality manual and procedures followed by divisional level manuals and procedures and finally, functional plant level documentation. Each level needs to have links both to the level above and below and should support the overall quality policy of the organisation. This should be declared at the highest level.